I was in Bandung for a few days. Friendly people, beautiful village and great weather, I am missing Bandung already. Shot in Fujifilm X-T1 with XF23mm F2. Bought and tested the new Fujifilm XF23mm F2 on my X-T1. Initially worried about close-ups at wide open, the concern is actually unfounded. Look at this shot at F2, it is simply tack sharp although I am missing the bokeh of my XF35mm F1.4. School trip to Ipoh, Malaysia, shot with Fujifilm XT1 and XF 35mm lens. Kyushu Island (Fukuoka – Kumamoto – Kurokawa – Yufuin – Fukuoka), Japan in April 2015 with Fujifilm XT1 and XF35mm lens. It kept raining and it was colder than expected but we managed to catch the cherry blossom season in time. Shot with Fujifilm XT1 and XF35mm lens in Provia. Excellent combination for travel although I sometimes wished it could be wider. I also tested fast action photography at the Merry-go-round and I think XT1 has passed the test. Looking forward to more shoots with the XT1. I had one night stopover in Hanoi. Shot with iPhone 5. Shot with iPhone 5. Wish I have a better camera with me though. 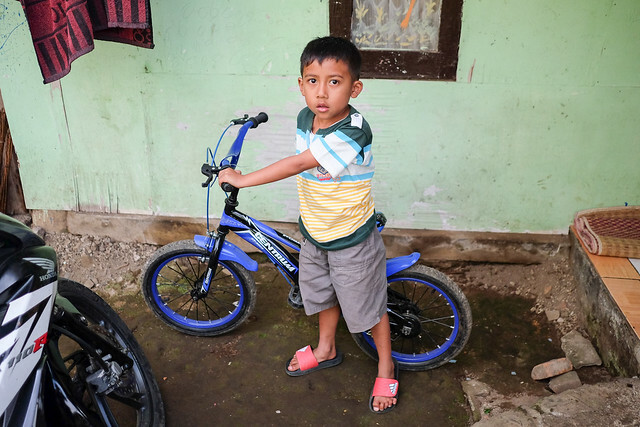 Although the villagers are poor and many men have to go away to Malaysia’s oil palm plantations to toil for years to support their families, somehow every kid seems to have his or her own bicycle. They don’t have much but rejoice in the little that they have.